C’mon Amazon, ship the way you say you will! Amazon, like any large shipper, is always looking for the least expensive way to get packages from Point A (their warehouse) to Point B (my home). We live way, way in the boonies, so we like to get our stuff at the local Post Office. No problem, Amazon allows that, right? Well… I paid for shipping via the Postal Service. But take a look at the screen shot below. Amazon handed the package to FedEx, who got it as far as Ridgway, our little town. We inquired of our local Post Office where it might be. After considerable research, they said it was at a FedEx facility in Montrose, 30 miles north of here. They thought FedEx would drop it by the post office the next day. Not so! 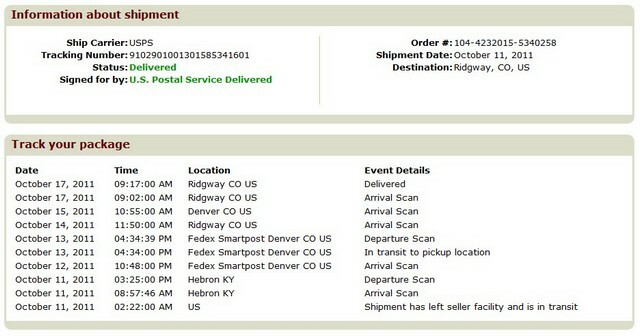 As you can see from the shipping record, it went all the way back to Denver, 300 road miles away! It appears to have made the transition into the (more predictable) hands of the Post Office, and we finally received it on the date noted. Here's a screen shot showing how my purchase was routed. I asked it to be shipped via USPS and paid for the shipping, even though the purchase qualified for free shipping. But it crossed the Rockies three times trying to get here! Okay, you say, why don’t I just have it shipped to my home address? It seems obvious, but then things work the other way. As it turns out, the county boundary and the zip code boundary don’t match, so our post office is technically Montrose. So here’s what’s happened to me in the past. FedEx Ground, or UPS, ships it to Montrose and then hands it to the Montrose Post Office for final delivery. Except we don’t get mail here—it goes to a tiny box down by the highway, a box too small for a package. So, we get a notice that we have to drive to the Post Office, 20 miles away, to pick it up! Hey, wait a minute! I paid to have it delivered to my home, not to a place 20 miles north of us! How to solve this problem? I don’t know. Clearly there are agreements between the major shipping vendors to help each other out, and Amazon takes advantage of every cost savings it can. But…c’mon Amazon! Have some pity on us poor folks in the boonies and ship the way we ask and pay for! This entry was posted in Product Reviews and tagged Amazon's shipping policies. Bookmark the permalink. 1 Response to C’mon Amazon, ship the way you say you will! I just stumbled across this, Dave. I had to send my new GoPro back and was afraid the new one might not make it before I left for Colorado. But it arrived two days EARLIER than they initially said it would. We too live in the booneys, but not as remote as you, and have had some issues with FedEx. Not this time though. Some results of the GoPro experiment, and my Million Dollar Highway ride, can be seen at http://www.advrider.com/forums/showthread.php?t=828017. Just have to remember to clean the lens from time to time! PS, was going to ping you on the Montrose repeater but I couldn’t bring it up for some reason.